At Mona Vale Dental, we are excited to offer same-day crowns with our advanced CEREC technology, patients with damaged or decayed teeth can have a crown designed, crafted and placed in a single dental visit. Patients have relied on dental crowns to repair compromised teeth, for years. A dental crown (also known as a ‘cap’) completely covers the tooth after the necessary preparation is completed to resolve structural issues. With the use of our modern dental techniques and equipment we fabricate crowns that feel and look natural. All of our dental crowns are custom fabricated to restore the functional and aesthetic features of your teeth. All this is done in a single visit for most cases. This eliminates the need for you to visit the practice multiple times, spread out over weeks, while an external laboratory fabricates the crown, and you have to wear a temporary crown. With our advanced CEREC technology, your crown is made and placed in a single visit. 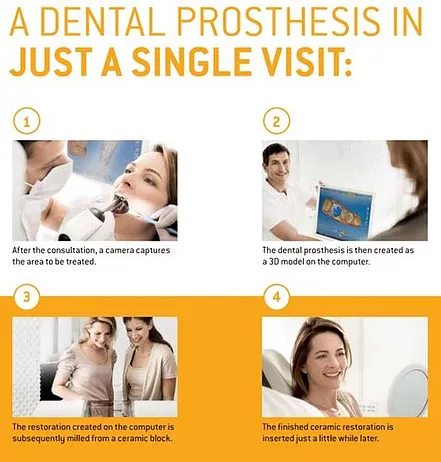 Your dentist will first take digital impressions of your treated teeth. This method requires no messy, uncomfortable putty, and is especially beneficial for those who have a gag reflex. The digital images will then be directly transferred into a chairside computer which designs the new tooth and guides a milling machine to make your crown. During the milling process you can relax in our waiting room. In all the entire process takes about an hour. When the crown is complete, your dentist can make some fine-tuned adjustments to the crown to ensure an optimal fit. Finally, the crown will be securely attached to your tooth with a special bonding agent. There’s no need for temporary crowns or additional appointments. Less discomfort and fewer appointments. Since CEREC restorations only take a few minutes to be created, there is no need for a second appointment, or multiple injections of anesthesia and you won’t need to wear a temporary crown. Strong, durable CEREC crowns can last for years, with proper care. One of the many benefits of the CEREC system is that each restoration is milled from a single, solid block of porcelain, making it resistant to cracks and fissures. The traditional method of pressing and layering to create crowns lacks the strength and durability of the CEREC method. CEREC crowns look natural, they are made from ceramic materials that mimic nature with its opalescence and transparency, much like the natural prisms in tooth enamel. Each ceramic block is offered in a range of 17 different shades. We then carefully custom-tint and glaze your restoration to match your natural teeth precisely. With CEREC, we can scan your mouth digitally, eliminating the need for foul-tasting, messy impression materials. Biocompatible, metal-free materials. CEREC restorations are made of ceramic porcelain that is compatible with your body. Unlike restorations that use metal, there are no mercury or gray lines at the base of the tooth near the gum line. Faster recovery time with less tooth sensitivity. CEREC restorations can be used to restore a tooth that has undergone a procedure, such as Root Canal Therapy. Restoring a tooth immediately after a treatment provides protection, resulting in a lower risk of fracture of the tooth and prevention of further infection. How is a dental crown attached? A dental crown is attached using a dental bonding agent, which effectively cements the tailor-made crown to your affected tooth or implant. Modern dental crowns look and feel entirely natural, and are made of ceramic porcelain. Due to their durable materials, dental crowns last for years. A dental crown is a procedure that caps a tooth or dental implant, usually preventing cavities from becoming larger and to strengthen an already weakened tooth. Dental cement is utilised to bond the crown to the tooth. A bridge is a prosthesis used to replace missing teeth and is joined to adjoining teeth for a natural look.